Our home staging clients often tell us how much they wish that they had brought us in sooner, before they decided to sell the house, so that they could have enjoyed some of the changes that we made! They especially love seeing some of our home staging tricks and hacks first hand, so we’ve decided to share some of our favourites with you! 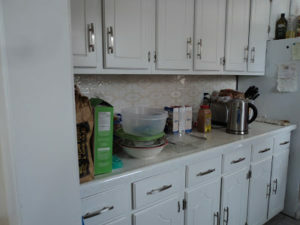 You can put these low-cost ideas to use in your home, regardless of whether or not you are selling. It’s not a fancy trick, but it can be incredibly effective. 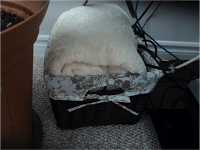 Hide routers, cables, and other messes using baskets. NOTE: some items (such as routers) need room to vent, so be sure to account for and allow for this. 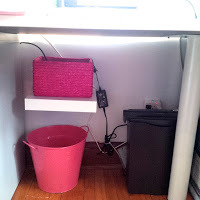 Consider adding a shelf under your desk to get the cords and cables off of the floor. In staging, there is nothing worse than seeing a long dangling cord behind a table. By zip-tying these, they can be cleaned up and out of site. Wind up extra slack in the cable or cord not needed and tie. You can bundle the cord close to the table top and tie, or tie the cord to the table leg at the top and bottom, and bundle the cord at the base. It’s easy for cables and chargers to become a bit of a mess as well. 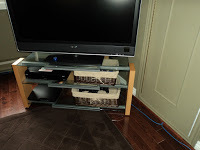 Group your office or tv cables together and zip tie in a few spots to keep them from getting tangled. It’s also a great idea to label your cords (close to the plug) so that you can easily unplug one when you need to without needing to do serious detective work to find the right one to disconnect. There are a variety of cord labelling systems available for sale, but it doesn’t need to be fancy – you can these create with any labels or tape that you have in your household already. This will prevent the wall from splitting when you puncture it with the nail. Simply place a small piece of tape (approximately ½”) where you want to hang the nail before hammering. 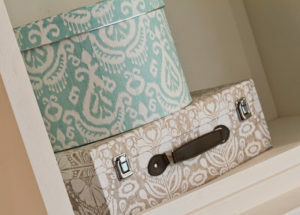 Hat boxes are an attractive way to hide your everyday toiletries, and come in sizes large enough to fit your lotions and sprays easily! While it’s not the most glamorous fix, this is a trick that is often used in home staging, and works great for giving furniture a quick touch-up from nicks and scratches. When you’re selling your home, even though you are not likely selling your furnishings, showing care of these items will help to show pride of ownership in your home. One of the biggest things that can show a fireplace’s age is a brass trim! Pick up some black barbeque paint and cover the brass for an instant update! Have an out-dated backsplash but can’t afford to replace it? Painting it will give it a fresh new look! This is intended as a temporary solution, but with the right paint, it can last for a few years. Not recommended for floor tiles. 8. Yes, you can paint brick! 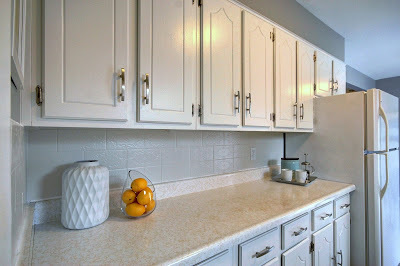 Paint brick to give an instant update, whether on the interior or exterior of your house. Again, you’ll want to ensure that you are using a paint designed for this type of surface; you’ll be amazed by the finish. 9. Need a table runner? Create a “make-shift” table runner from an old drape with a few tucks and folds (if you don’t intend to use the drape again, you may wish to cut it and add some hem tape to create a proper seam). 10. 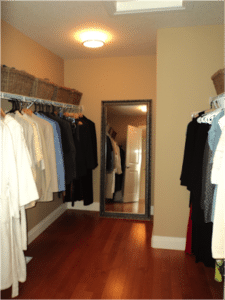 Get a custom closet for less! Hang all similar colours together with matching hangers and add baskets to your shelves. Use space saving hangers for best results – your closet will look and feel much more organized and spacious!